What's Going On In The Piano World? Mason & Hamlin Piano Factory Tour 2017! That's right, it's time for another exciting tour of the famous Mason & Hamlin Piano Factory in Haverhill, MA. If you've ever wondered how fine pianos are built this is your chance to see them in action from beginning to end. New Items In Our Online Store! PianoSupplies.com is our online store for music lovers. It started as primarily a source for piano related products but we've since expanded into other music related items as well. Have a look! Have you visited our world famous piano forums yet? The stats you see on the left here are from a snapshot of our forums. 87,000+ registered members, over 2 million posts. Lots of great information and fun posts. Best of all? It's free! We love that our members host piano parties all around the world. This one is coming up soon in Spain. Kathy and I attended one in Milan Italy last year (it was wonderful) I wish we could have made it to this one. Spain Piano Party Details Here. ( Malaga -Costa del Sol, Spain to be exact).
" On this latest trip to China, I managed to catch a glimpse into the transformation of Pearl River Piano. Already the largest piano company in the world manufacturing more than 130,000 pianos annually, Pearl River Piano has its sights set on even greater advancement. One hundred thirty thousand pianos annually equates into about 400 pianos being manufactured per day. Imagine though what it must be like to produce 400 pianos daily. With roughly 225 tuning pins per piano, that’s 90,000 coils per day. Conservatively a piano contains 200 pounds of iron for each frame. That would be 80,000 lbs of iron plates per day, 35,200 hammers and piano keys per day, 2.4 million action parts per day… you get the picture. These are staggering numbers. And behind these numbers are equally massive storehouses of wood, machinery, and a company employing thousands of people." Did You Recently Get a New Piano? (not necessarily brand new, just new to you). We'd love to see pictures and hear the story. In fact we have a sub-forum just for that purpose. Why Do You Play the Piano? An interesting question, one which has generated a lot of different answers. It seems the desire to play the piano can come from many different sources. Read the posts, some are short and sweet, others are fairly long (but interesting) stories. And feel free to add your own. Why Do You Play the Piano? Click here for the thread. We've been collecting locations of pianos that are available to the public to play, as well as venues that feature piano. The plan is to organize and map the collection. In the meantime, check it out and please add to the lists if you can. Live Piano Music Venues & Public Spaces - Where Are They? Ever wonder how to follow a topic? you would like to monitor. To reverse this, go back to the same place only this time one of the choices will be to Remove Topic from Your Watched Topics. You should be Advertising On Piano World! Show Us Your Piano Room! 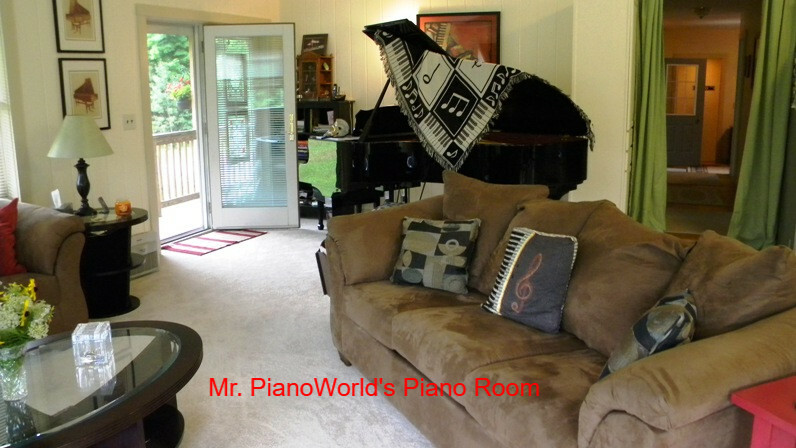 There is a long running thread on our piano forums where members have been posting pictures of their piano rooms. Piano room is all encompassing, so if you have a digital piano, keyboards, acoustic piano(s), anything like that qualifies. The thread is 37 pages long right now. Feel free to add your own, but PLEASE be sure to upload your picture(s) to our servers. Too many times we find other services drop the pictures leaving a blank place where the were. 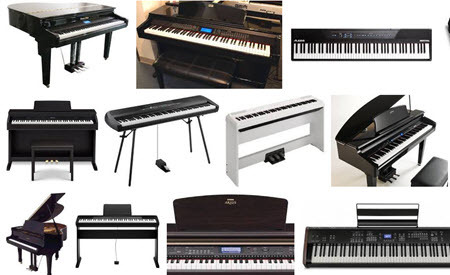 Did you know we have a forum dedicated to digital pianos, keyboards, and synthesizers? That's right, a special forum for non-acoustic pianos and keyboards. There are over 280,000 posts in this special forum. And in the moments when I was writing this there were over 440 people perusing the Digital Forums. It Ain't Free Babe, No No No it Ain't Free Babe! It seems a lot of people assume because we don't charge anything to access Piano World or our piano forums that it's just my hobby, or maybe it's magically supported. It's neither. Piano World is the primary source I rely on to support myself and my family, it is what I do for a living. It's how I pay my part timer, and my suppliers (for our online store). It's how I pay my bills, buy groceries, put gas in the car. You get the idea. While it's true that our advertisers https://pianoworld.com/advertising/ are a help, many of them have been cutting back, and this being summer sales in our online store (www.pianosupplies.com) are very slow. If you enjoy Piano World and/or the Piano Forums, please consider showing your support. Did you know you can become a subscribing member of the forums/pianoworld ? Under the "My Stuff" drop-down near the top of the page there is a link titled Subscriptions. Click the link and you will be presented with choices as to what level of support you'd like to contribute. After you make your choice and sign up, you will automatically get a special icon under your username indicating you support the forums. Kathy, Kirby, Cara, and I thank you for your support and for helping us grow Piano World.